Back in 2001 I co-founded a surf school with extreme sports couple Dez and Garret Bartelt. It was my first experience marketing and now looking back at it, I realize that we were using Customer Development to get it started. Before a student had caught their first wave, I created a very ugly and simple web page about the business and placed it on their site (they had a guesthouse). It simply mentioned a bit about what we aimed to do a link to a contact form and a phone number. Screen shots from archive.org are below. You’ll notice no pricing information or even any details of the programs available. These weren’t set yet. Calls and emails went through to Dez who listened to what they were looking for and offered them one of the options we’d come up with. She took a 50% credit card deposit on the lessons. The bookings were for delivery several months in the future. Once there were enough bookings we ordered the equipment and I structured the lessons to what the first clients had come discussed when booking. As the initial surf instructor, I was well placed to elicit from clients what they were looking for in their experience. I could then use that feedback to tailor the packages offered and the website copy better to the different market segments. Also importantly, people started telling their friends. Asking our referral students what had brought them to us yielded new information about the market. It also yielded a different type of student. Whereas people searching on Yahoo were already looking for surf lessons, referrals were after a new experience and responded to surf lessons in the tropics as being something different. I stayed on for 2 seasons but moved on before things really scaled up. After Dez got an article in the New York Times, things went ballistic and her and Garret later expanded the model to Panama. Its now part of their global adventure companies including – Best of Both adventures. 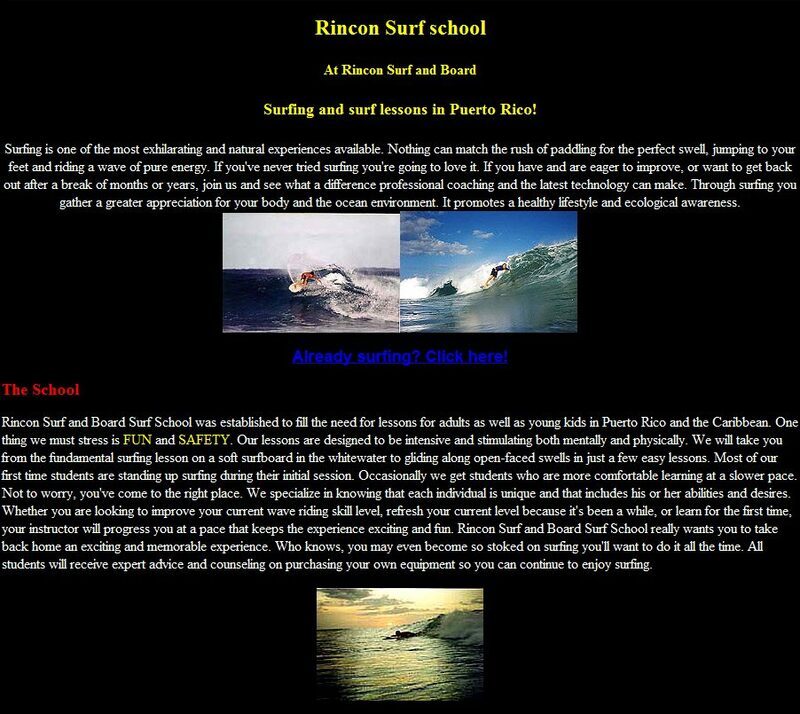 The school still runs today see Rincon Surf School.